The first time I heard Sarah Vowell on the public radio show This American Life, I tried to adjust the bass, the tone and the balance of my speakers to right the wrong of Sarah’s quirky sound. It was no use, and this made me happy. It was great to hear someone who sounded worse than the gravel truck parked in my voice box. So, Sarah mentioning the Civil War was like a sweet musket shot to my heart. Now, on Friday night, I have a date with Sarah Vowell. I really am going out with Sarah. There’s a possibility this will be like a double-date with 2,000 other people, but still, it’s special between us. Squeaky to gravel-truck voice. She’s an American history buff, and I know six of the original 17 colonies. Besides, what’s a date, anyway? You pay money (in this case $27.50 to the Capitol Theatre) to sit with a girl and listen as she talks about herself. At the end of the night, if things go well, you might take her home (I won’t). That most likely will be our entire interaction but, still, I want to look my sharpest for Sarah. In one of her stories “American Goth” Sarah says she likes her clothes to be the colors in the “bruised pallet of gray, black and blue.” The Civil War colors of the North and South. To get that “just off the battlefield” beat up, bruised look, I need to go shopping. And, since I can’t afford new clothes, it’s time to hit the thrift stores. At the Deseret Industries (131 E. 700 South), I found a very goth-like pair of black corduroy pants for $5. These pants must have been European, because they came in a manly size 12. 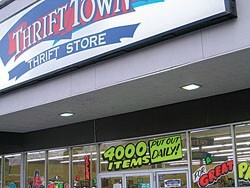 Unable to find the perfect shirt to complement my pants, I headed over to Thrift Town on 3300 South. There I struck gold. Black gold. For $2.99, I found a Woolrich sweater. But, just because black is what I’m wearing on the outside, that doesn’t mean I want to feel black on the inside. For 69 cents, I also unearthed an 85 percent polyester blend of slightly used, very soft, pinkish boxer briefs. Sarah says it would never occur to her to wear pink. This is the kind of spice I want to bring to our date. Sixty-nine-cent underwear. 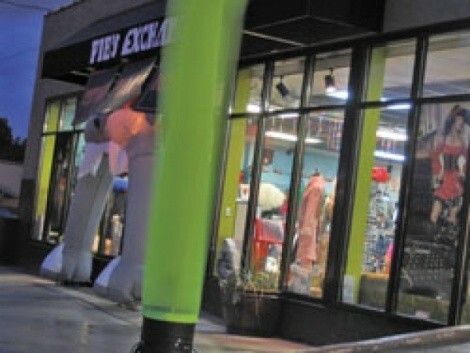 After assembling a near perfect wardrobe to make Sarah take notice of this battled Southern gentleman, I stopped by Pib’s Exchange (1147 E. Ashton Ave). Somewhere in this store, I knew the perfect T-shirt was hanging around, waiting to be worn underneath a wool sweater and just above broken-in boxers. 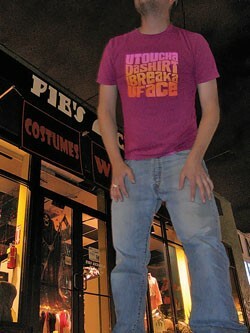 I wanted a shirt that would make strangers nervous and women (Sarah) swoon. A shirt that says, “Don’t cross this Mason-Dixon Line.” Turns out, my $7 pinkish shirt says, “U Toucha Da Shirt, I Breaka U Face.” At least it matches my underwear.